With the release of the Sanchin Kata For Everyone DVD, I thought I would take this opportunity to explain the derivation of the dynamic philosophy I call Jiriki Kata-Do and the integral role Sanchin plays in this methodology. For a link to a free online preview, please see the end of this article. Jiriki Kata-Do is derived from Goshin-Do Karate-Do. Its salient point; however, is that Jiriki Kata-Do is designed for the non-martial artist. Jiriki Kata-Do is a methodology that combines and distills martial arts physical protocol, Kata, philosophy and ideology into a program that gives the non-martial artist access to an otherwise secret means of attaining physical and spiritual well-being. Once the sole province of and jealously guarded by martial artists who have devoted decades to retaining these secrets, Jiriki Kata-Do unveils these secrets to everyone. Jiriki Kata-Do translates as “Salvation from within through Kata.” In this context, salvation means physical and spiritual well being. Physical movement is combined with spiritual awareness to produce an active, or dynamic, meditation process. Jiriki is contrasted with the concept of Tairiki. 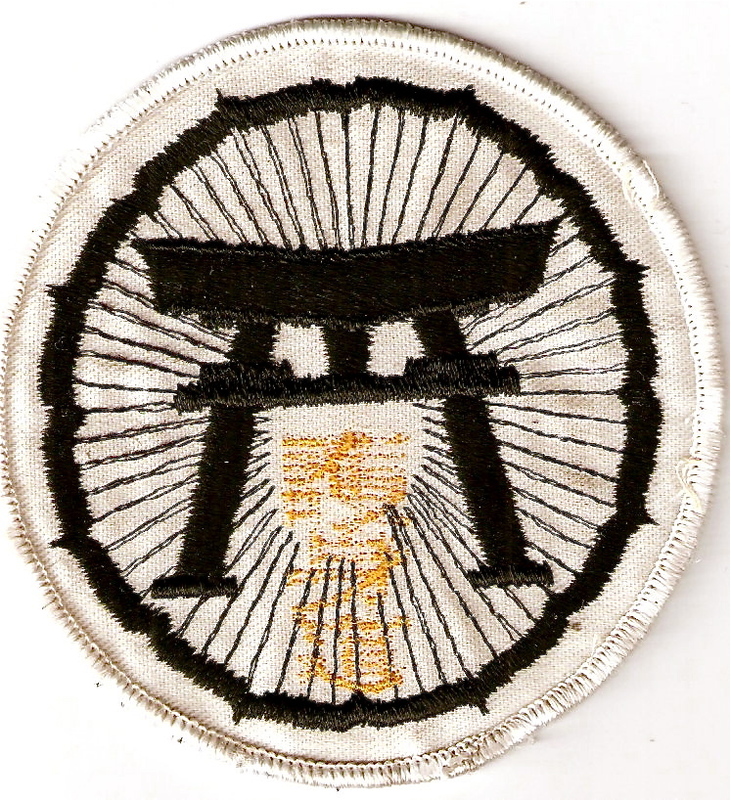 In tairiki, one can achieve physical and spiritual balance; however, the means of such achievement is from a source outside of oneself. Thus, methods that employ tairiki concepts, such as, training facilities, personal trainers and even elevated pursuits such as yoga, require the intercession of a third party such as a coach, trainer and the like. The impetus for my creation and evolution of Jiriki Kata-Do are certain, select, sophisticated Kata of Goshin-Do Karate-Do as taught by Shihan Thomas DeFelice, Ku-Dan, Karate-Do No Hanshi. 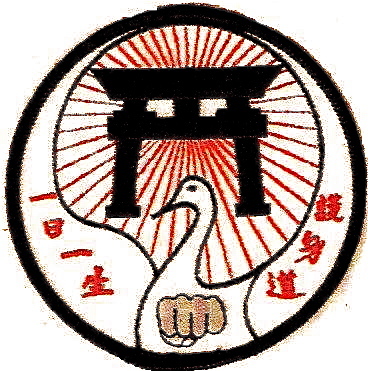 The relationship between Jiriki Kata-Do and Goshin-Do Karate-Do may best be characterized by saying Jiriki Kata-Do is the epiphenomenon of Goshin-Do Karate-Do. Jiriki Kata-Do could not exist but for Goshin-Do Karate-Do, whereas Goshin-Do Karate-Do can, and has for over six decades, existed without Jiriki Kata-Do. 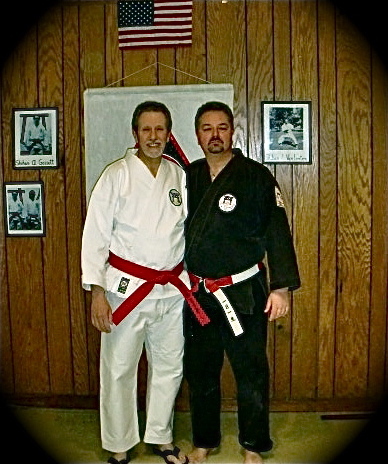 Prior to his untimely passing on May 18, 2011, I had a conversation about Jiriki Kata-Do as a dynamic meditative practice and the martial art of Goshin-Do Karate-Do with Shihan Wayne Norlander, Ku-Dan, Karate-Do No Hanshi, USA Goshin-Ryu Karate-Do. 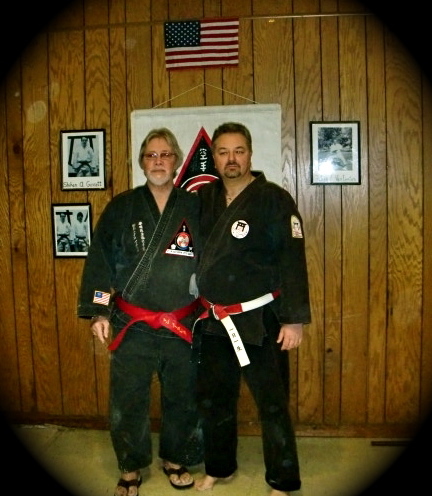 With Shihan Wayne Norlander, R.I.P. In that conversation, I ascribed the following symbolism to the interrelationship between these two arts. Goshin-Do Karate-Do is symbolized by a pot of boiling water. To the uninitiated cook, the water simply boils; however, to a culinary connoisseur, the boiling water must be studied, refined and specifically defined. The novice would simply describe the water as boiling; whereas the connoisseur would describe the boiling water as a hard-boil, or a rolling-boil or steady-boil. In comparison, the novice simply describes Goshin-Do Karate-Do protocols as Kata to be learned, like a dance. The aesthete devotee of Goshin-Do Karate-Do seeks to clarify, refine and identify the Kata in a manner similar to the chef and the boiling water. That is to say, the aesthete desires to explore the minutest detail of the Kata within a specific self-defined genre. For me, this process of exploration viewed the Kata initially as a means unto themselves and eventually within the overall context of self-defense, called “bunkai.” This process led me to explore the full extent of the of utility learning Kata. As I looked into this symbolic pot of boiling water, I began to realize that clarifying and defining the water within the context of the martial arts, while fulfilling, was no longer personally sufficient. I realized that my destiny was to explore the epiphenomenon of the boiling water. My predestined passion lay in exploring and seeking to clarify and define that amorphous by-product of the boiling water, the illusive steam. Thus, I was driven out past the traditional boundaries of the proverbial boiling pot of Goshin-Do Karate-Do Kata into the realm of the steaming Jiriki Kata-Do. Jiriki Kata-Do, as the symbolic steam produced by the boiling water of Goshin-Do Karate-Do, is the resultant effect that is neither water nor its atomic component of hydrogen and oxygen. Jiriki Kata-Do is the preeminent result when a force (heat in the boiling analogy), physical effort, mental intuition & innovation in the case of Jiriki Kata-Do, is applied to the basic fundamental building blocks (such as H2O molecules in water) and Goshin-do Karate-Do Kata in the case of Jiriki Kata-Do. 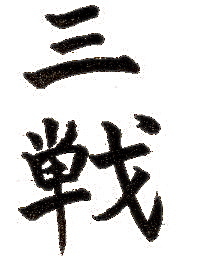 Sanchin is the “Gateway-Kata” to Jiriki Kata-Do. 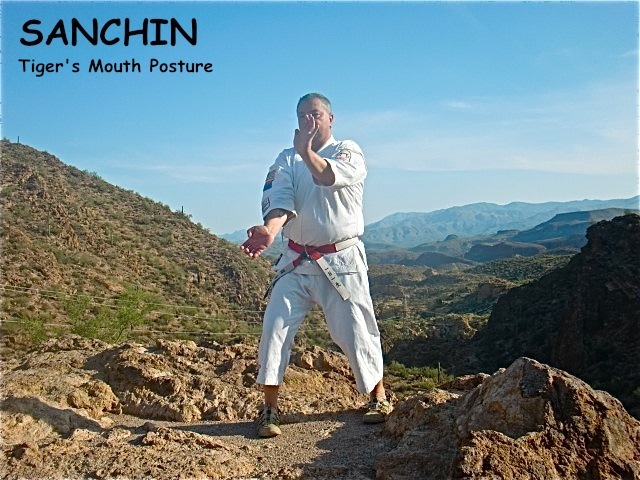 Sanchin provides a means of enlivening and enhancing the otherwise mundane aspects of life, to wit: breathing, bodily movement and state of mind and explores and enhances them. Thus, the three battles, or three aspects of human life are found in Sanchin. (See Endnote # 1). Sanchin further combines these otherwise mundane physical aspects and synchronizes them with an elevated spiritual aspect through the exploration of various states of mind and a misunderstood metaphysical aspect which explores one’s internal bio-energy (called Chi by the ancients) and its symbiotic relationship the the external energy of nature and the universe that surrounds us. Thus, Sanchin explores the necessary elements for life itself. This exploration, when individually undertaken through a pure study of Sanchin, will produce an enhanced life experience for the practitioner. 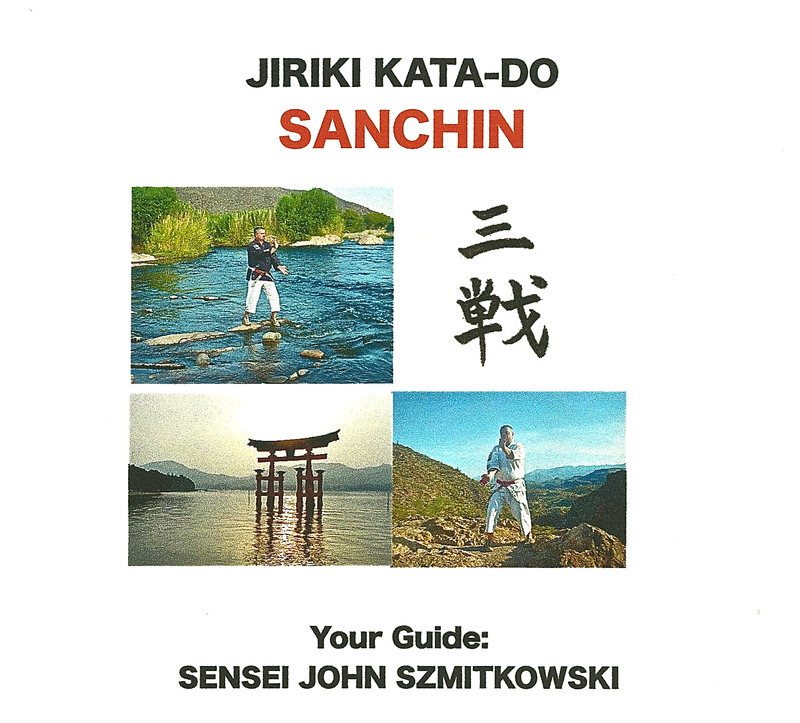 Sanchin, as the gateway Kata to Jiriki Kata-Do is revealed to the non-martial artist in my new DVD and book. Now the treasure of Sanchin, once jealously guarded by the martial arts, is available to everyone. Until the next article, I remain, performing Sanchin and exploring the resultant steam of Jiriki Kata-Do. 1. The definition of the Three Battles, or human aspects, of Sanchin as: breathing, bodily movement and state of mind is a fundamentally rudimentary definition. Through continued practice of Sanchin, a more elaborate, and even controversial, definition is to be found. Curious? An answer is contained in the Sanchin DVD.